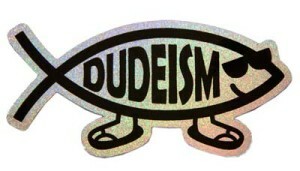 Spread the Dude word with our far-out stuff. 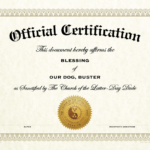 We’ve got ordination certificates, I.D. cards, stickers, patches, tee shirts and a lot more. 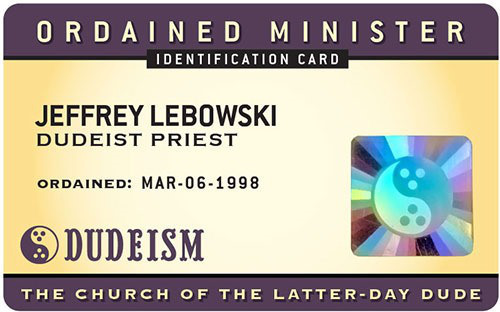 Contains: 1 Dudeist Priest I.D. 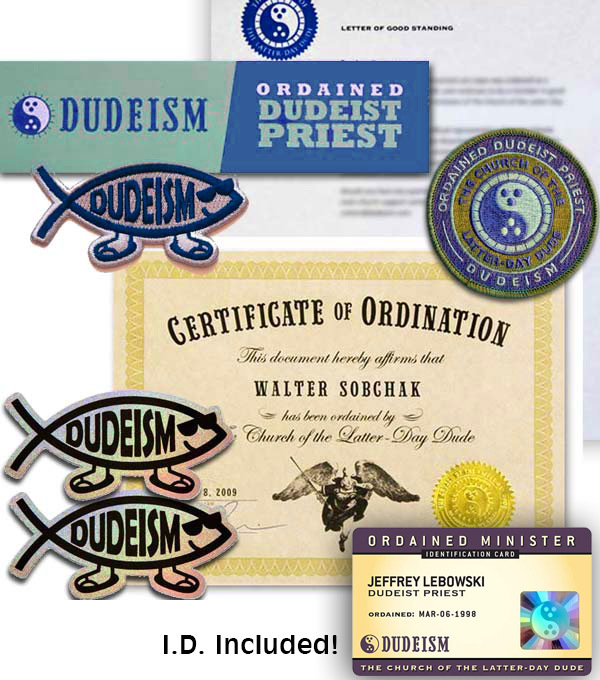 Card, 1 Ordination certificate, 1 Ordained Dudeist Priest Patch, 1 Dudefish patch, 2 Dudefish stickers, 1 Bumper sticker and 1 Letter of Good Standing. Purchased individually all this would cost $46.00, so this kit saves you over 30%. Important: Please fill out the two fields below, or there will be no name and date on your materials. Not yet ordained? Click here to do so first. Note: Nevada state and New York City residents require special processing. Contains: 1 Ordination certificate, 1 Ordained Dudeist Priest Patch, 1 Dudefish patch, 2 Dudefish stickers, 1 Bumper sticker and 1 Letter of Good Standing. Purchased individually all this would cost $31.00, so this kit saves you almost 30%. Important: Please fill out the two fields below, or there will be no name and date on your materials. 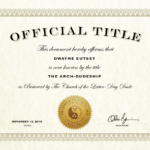 Not yet ordained? Click here to do so first. 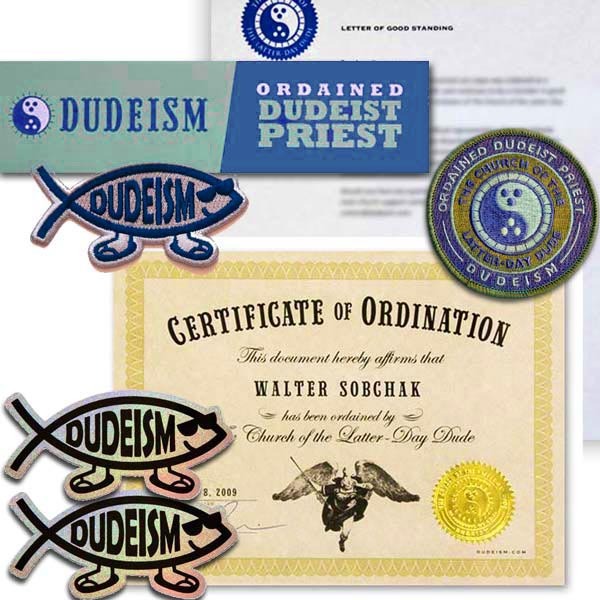 Want to be able to prove to people that you’re a Dudeist Priest at Dudeism but don’t want to carry your ordination certificate around with you? Order one of our credit-card-like IDs and you can flip out your credentials on the spot. 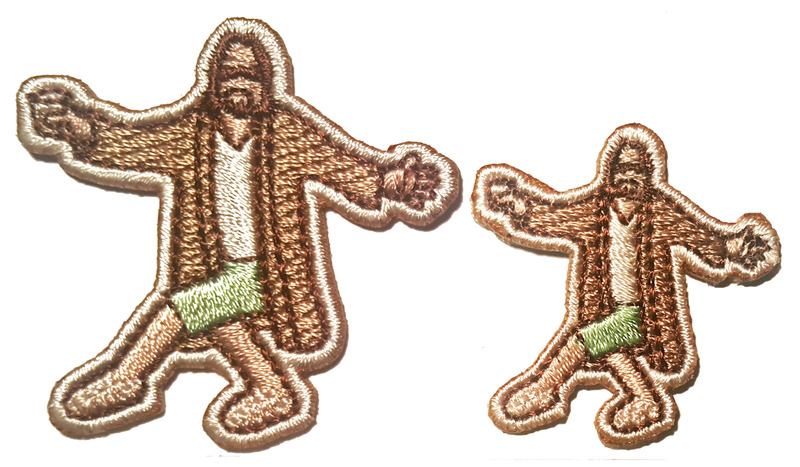 They even have holograms with the Dudeism logo on them. 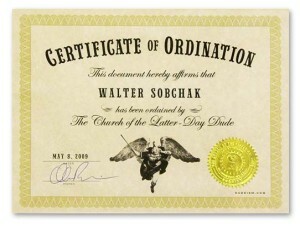 Please double check your name and date of ordination carefully! Because of the labor-intensive nature of manufacture we can’t issue re-dos if you make a mistake. 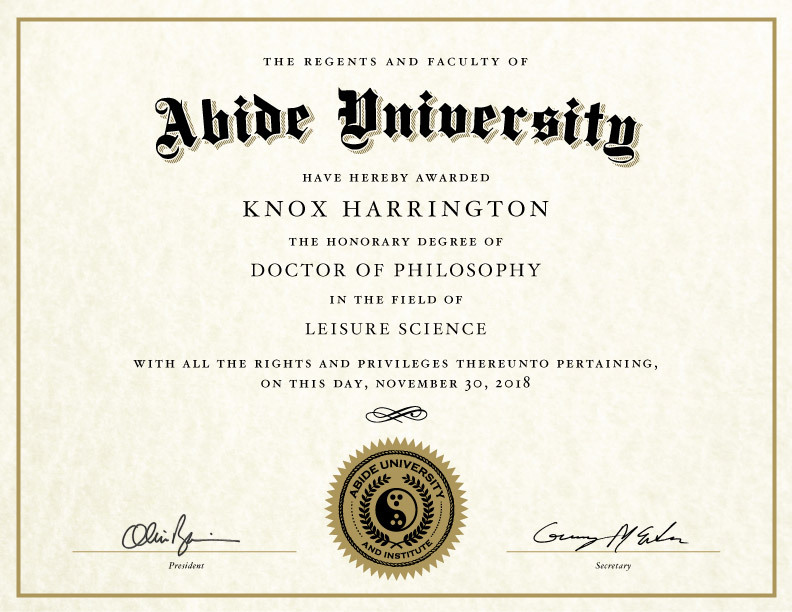 We’ve finally launched Abide University! It’s a laid-back online learning center for followers and fans of Dudeism. You can get a free Ph.D or other degree in several different fields of study, and you can also purchase a super-high quality gold-sealed, frameable print here. 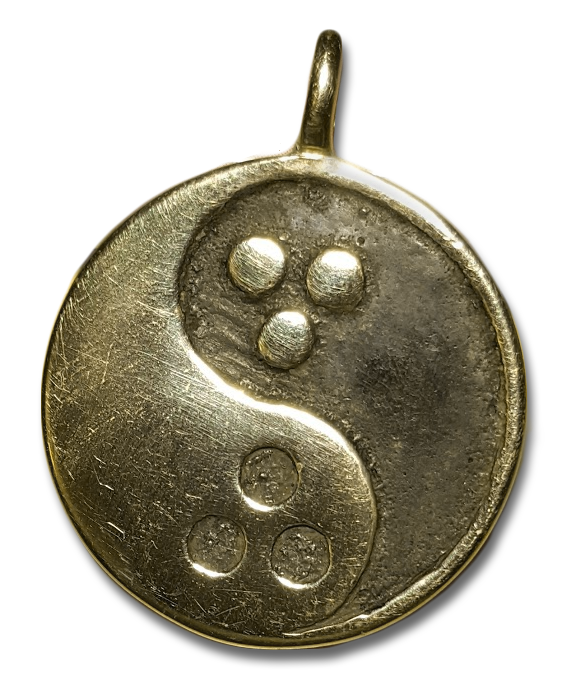 Click here to go to the Abide University store page. 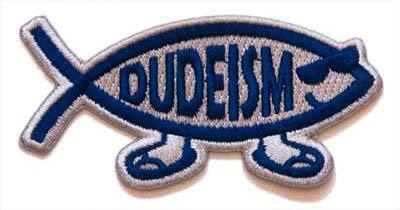 Sanctify any item of clothing, backpack, hat or bag easily with this intricately-embroidered iron-on patch. Affirm your abidefulness to the world. Every religion has some version of the original fish emblem. Ours is probably the most casual. Flip flops and sunglasses ensure that our Dudefish is never out of his element. Easily iron-on to any textile. Earn the respect and admiration of like-minded folks everywhere with this easy-to-apply sparkly chrome sticker of the beloved, abideful Dudefish. Great for vehicles, briefcases, musical instruments, windows, and just about anything with a flat surface. 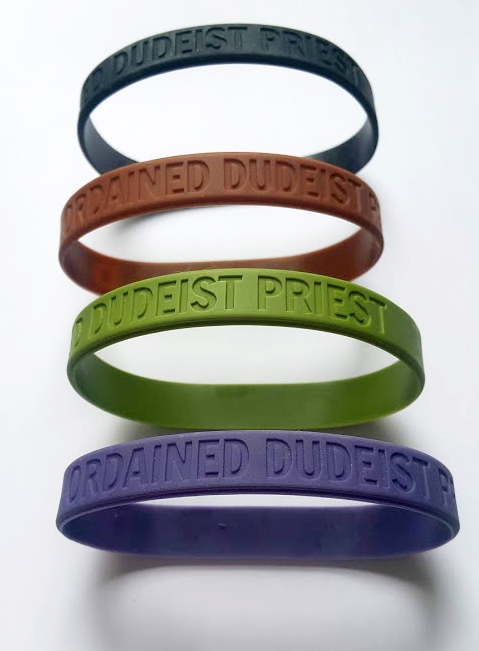 Comfortable, good-looking silicone bracelets in four different colors announcing your ordination and reminding you “What Would Dude Do? (WWDD)”. 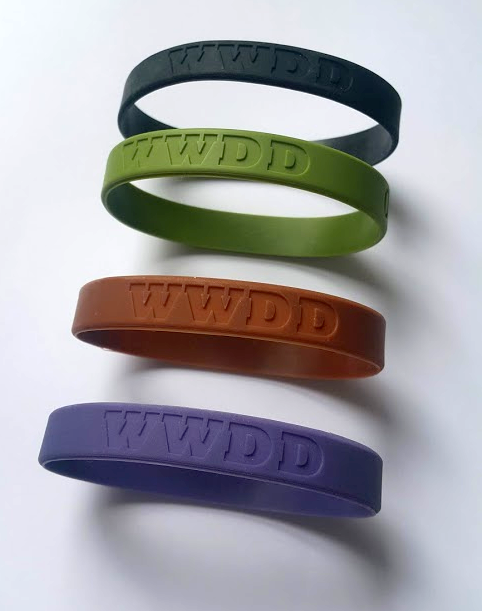 Get all four colors at a discount. 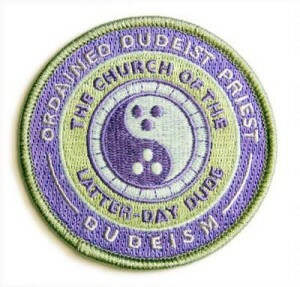 Show the world you’re an officially-ordained Dudeist Priest. Bound to earn you the respect of other drivers and put everyone on the road in a more mellow mood. 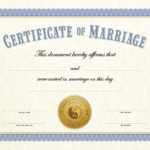 In order to allow you to perform priestly duties (marriages, etc. 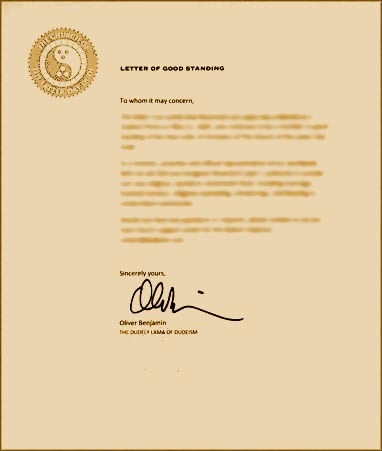 ), some U.S. State governments require a letter of good standing attesting to the fact that you are in fact an ordained minister. 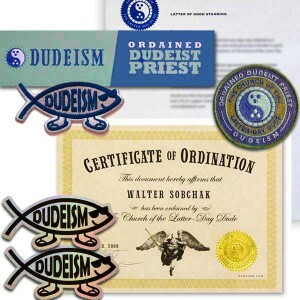 A bunch of official certificates for Dudeist Priests to provide at weddings and other ceremonies, as gifts, or as services to people. 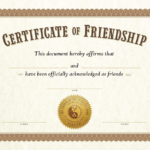 Wedding Certificates, Certificates of Appreciation, Certificates of Love or Friendship, Official Title Certificates, and more. 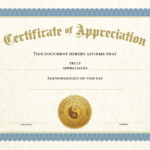 Click here to go to the Other Certificates page. 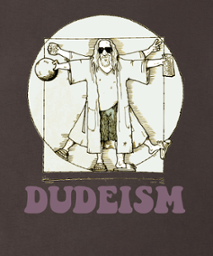 We’d like to spend more time spreading the Dude word and less time at our day job, so if anyone likes what we’re doing and wants to donate to the cause, you know us, we can’t complain. Thankee. 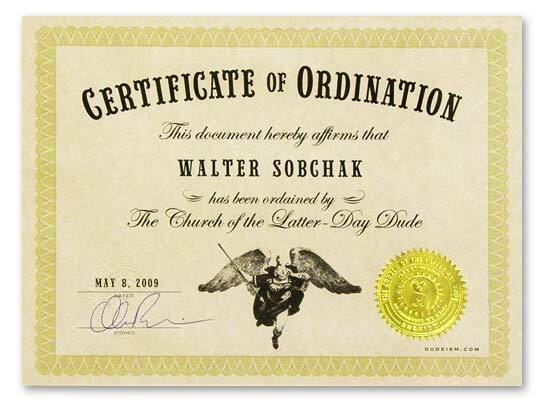 Our solemn guarantee: your money will go directly to help promote Dudeism and will not be spent by our staff on white russians and oat sodas. We’ve got a great selection of far out designs! Show off your ordination, or just celebrate The Big Lebowski and Dudeism. We’ve also got a new store we’re currently setting up at Galloree.com. 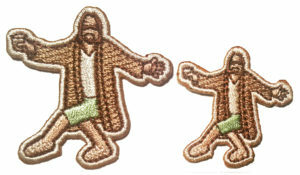 Check it out for beach towels and larger size garments in more colors. Soon there will be lots of other products as well. Amazon doesn’t currently ship outside of the US, so our international customers should use this store. UK customers: we’re also working on a new Spreadshirt shop. You’ll probably save a lot in shipping if you order from this one. Got some ideas for stuff you’d like to see us provide? We welcome any and all suggestions, criticisms and praise. Please let us know.